It will be love at first bite! With a caramelized tart cherry glaze, this roasted vegetable recipe is perfect for special occasions or weeknight meals. Thank you to The Cherry Marketing Institute for helping me to share this recipe with you. When we were first married, my husband and I were gung-ho about eating out on Valentine’s Day. We’d make restaurant reservations weeks in advance, get all gussied up and hit the town to celebrate the holiday. Many years later, after a few too many sub-par prix fixe Valentine’s meals, we came to the realization that eating at home, favorite beer and wine in hand, fire in the fireplace, was the way to go. When brainstorming ideas for this year’s Valentine’s dinner, I immediately thought of Montmorency tart cherry juice. Surely I could use it as a glaze for some sort of entrée or side dish. The rich red color just screams, “Valentine’s Day!” It just seems meant to be! I started playing around with both the juice and the concentrate. After a bit of tinkering, I decided that the Montmorency tart cherry concentrate, when simmered and reduced, makes the best syrupy glaze. Since the concentrate is naturally tart, I sweetened things up slightly with some maple syrup and added a dash of heat with a few shakes of hot sauce. Now that I had the perfect glaze, what was I going to put it on? Really, it could work with anything from chicken and beef to salmon and vegetables. 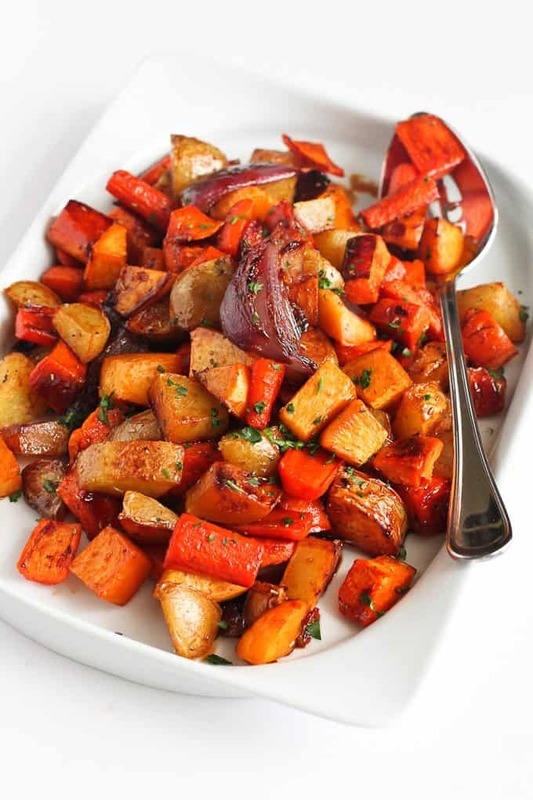 I settled on roasted root vegetables, since we can’t seem to get enough of them lately and I knew that their natural sweetness would be the perfect foil for the tartness of the glaze. This recipe calls for gold potatoes, sweet potato, rutabaga, red onion and carrots but, really, you could use almost any root vegetables that appeal to you. Use a different kind of potato, add beets, swap out the rutabaga and add in a turnip. The sky’s the limit! 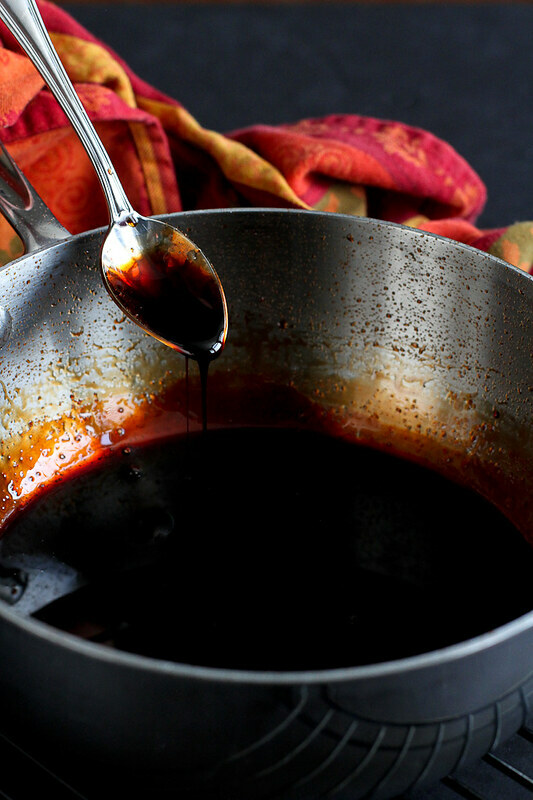 In a medium saucepan, whisk together the tart cherry concentrate, water, maple syrup and hot sauce. Bring to a boil, then lower to a simmer. Cook, stirring every couple of minutes, until the glaze is reduced by more than half. Remove from heat and let the sauce rest for about 15 minutes to thicken further. Preheat the oven to 425 degrees F, with oven rack placed in the bottom two positions. Lightly coat two baking sheets with cooking spray. 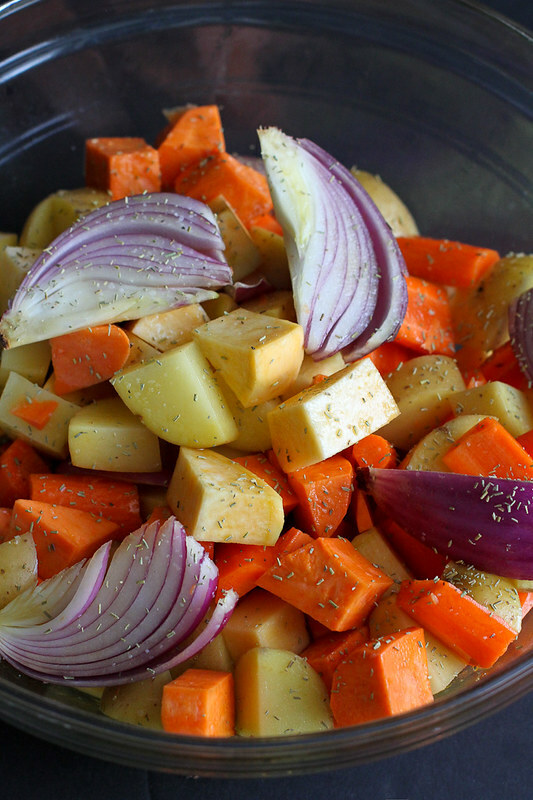 In a large bowl, combine the gold potatoes, rutabaga, sweet potato, carrots and red onion. Drizzle the olive oil over the vegetables, season with salt and crushed rosemary, and stir gently to combine. Take care not to break apart the red onions. Divide the vegetables evenly between the two prepared baking sheets. Roast for 20 minutes, then gently stir the vegetables and rotate the baking sheets from rack to rack, and front to back. Roast until the vegetables are tender when pierced with a fork and golden brown in some spots, an additional 15 minutes. Drizzle 3 tablespoons of the tart cherry glaze over each portion of vegetables. Stir gently to coat. Return to the oven for 3 minutes. Serve. Disclosure: This post was sponsored by The Cherry Marketing Institute as part of my ambassadorship with them. All opinions are my own. This post contains links to my Amazon affiliate page. Any revenue made from sales through these links helps to support this blog. Thank you! This looks amazing! Gorgeous photos too! Hi Deb, I typically replenish my tart cherry concentrate stock from Amazon, but I’ve also seen it at GNC stores, as well as other health food stores. Here are several options on Amazon: http://amzn.to/1mz6wgd (in full disclosure, this is an affiliate link). I’m totally with you on the staying at home thing. It’s so much cozier! And I bet this is amazing with the tart cherry concentrate. I have to give this a try! Your photos are absolutely beautiful, and we are definitely homebodies! I’m obsessed with the fact that these veggies are glazed with cherry. It’s such a brilliant idea! We used to do the exact same thing! But its always so crowded that we usually skip going out now! I so agree – we always used to go out until we realized how much the jack up the prices!! Now eating at home is a must. These veggies look SO good! Beautiful! Who knew vegetables could be so photogenic! Love that tart cherry glaze! I agree – home for Valentine’s Day is the way to go! And this tart cherry glaze…wonderful on the roasted veggies! I never thought of mixing the flavors of cherry and root veggies before but now that I see this post I think it’s a great idea. I can’t wait for you to visit the cherry capitol of the world!! And I love the sweet and spicy combo of this glaze- so gorgeous!! Dara, my dear, this is brilliant!!! 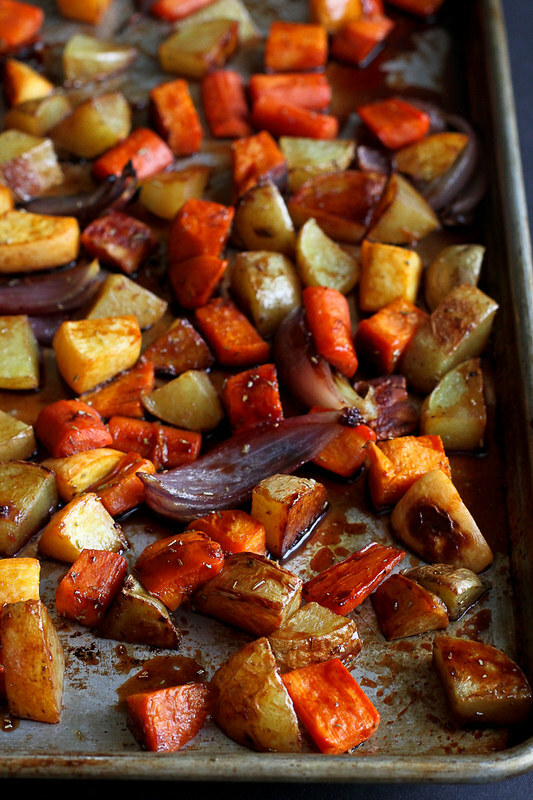 The color and sheen the cherry glaze gives the roasted veggies is incredible!! not to mention the touch of tart and sweetness that I’m sure the glaze adds. You are my hero! I simply can not wait to try this new method of roasting veggies! I typically replenish my tart cherry concentrate stock from Amazon, but I’ve also seen it at GNC stores, as well as other health food stores. Here are several options on Amazon: http://amzn.to/1mz6wgd (in full disclosure, this is an affiliate link).